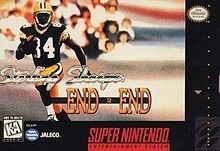 Sterling Sharpe: End 2 End for Super Nintendo is a football game endorsed by retired NFL wide receiver Sterling Sharpe (his career ended in 1994 due to a neck injury). The game was rated Kids to Adults by the Entertainment Software Ratings Board advisory panel. Win football games by following and complying with the standard rules of the National Football League. Referees deliver penalties to players (human or CPU) who commit penalties.